Goddess Durga is the ultimate deity and mother of the universe. Goddess Durga is the one of the forms of Maa Parvati who is the wife of lord Shiva. Goddess Durga has three main forms, i.e. goddess Saraswati, goddess Lakshmi and Kali Maa. In Hindu religion, devi Durga is the most powerful goddess. Goddess Durga represent the strength, ethics and courage so blessed the devotees with these qualities. She is the saviour of humanity, ethics and moral values while destroyer of evils and bad deeds. According to mythology, it is said that the devotees, who chant Durga Shatnam Strotam (108 names of Durga Maa) with devotion, Durga Ji pleased with them. 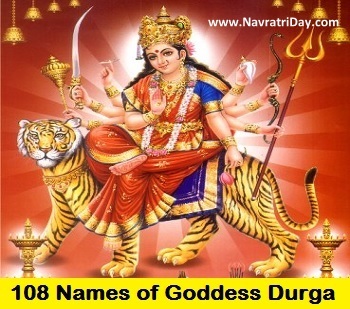 Below check the 108 names of Durga Maa along with their meaning. This year, Sharad Navratri 2018 is starting from October 10, 2018 and will be celebrated till October 18, 2018. During these nine days, devotees should worship nine goddess and recite 108 names of Goddess Durga to please her and get the blessings.